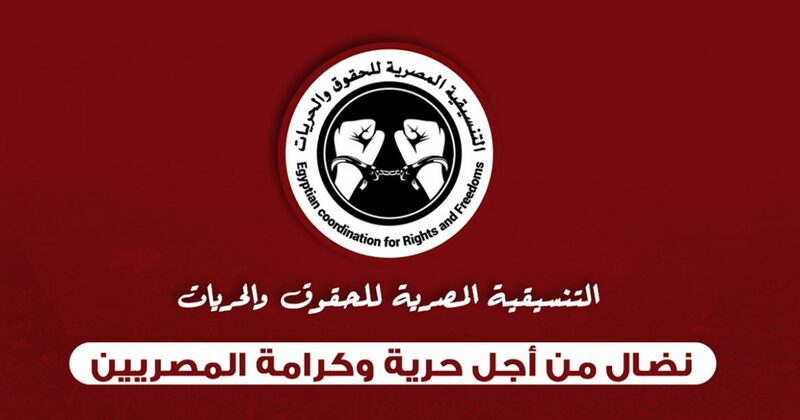 The undersigned independent rights organizations are gravely concerned by wide -scale arrests targeting human rights defenders with the Egyptian Coordination for Rights and Freedoms (ECRF), an organization supporting victims of enforced disappearance and torture and campaigning to end the death penalty. At least 31 ECRF staff members and volunteers were arrested in Cairo and other governorates in a frenzied raid beginning on November 1 by police and Homeland Security. On Thursday November 1, security forces comprised of police and Homeland Security raided Abdelmoniem’s home at about 1:30 in the morning without a search warrant. They blindfolded and took her to her mother’s house, which they searched, then back to her own residence. There she was left in a vehicle still blindfolded and under guard for two and a half hours, while security forces searched and ransacked her home. Abdelmoniem was then taken to a location that officers with the arresting force have refused to disclose. She was prevented from taking her medicine or any personal belongings from the house. At the same time, another force raided the home of Hureira—a former member of the ECRF—and his wife Aisha al-Shater. They were both arrested and their whereabouts have not yet been disclosed. The spate of recent arrests come after the forcible disappearance of rights lawyer and ECRF director Ezzat Ghoneim, who has been missing since September 14 of this year. Ghoneim, who had been jailed in reprisal for his rights work, was to be conditionally released on September 4, after which he was moved to the Haram Police Station to wait for Homeland Security investigations before his release. Yet when his family inquired after him at the police station ten days later, police denied Ghoneim was there. His whereabouts remain unknown, although two months have passed since the release order. The undersigned organizations affirm their full support of the ECRF, its team, and all rights defenders detained for their work and advocacy for victims of human rights violations. We demand the immediate disclosure of the whereabouts of those arrested in the recent campaign and their unconditional release. They are not criminals but human rights defenders exercising their fundamental right to freedom of opinion, expression, and association. We are concerned about possibility of false criminal charges being filed against the defenders and consider the security apparatus entirely responsible for their lives and personal safety. The undersigned groups urge local and international organizations to join us in demanding Egypt fulfill its obligations under the 1966 International Covenant on Civil and Political Rights by ending policies of arbitrary arrest and enforced disappearance, and creating a safe environment for human rights defenders, lawyers, journalists, and others to do their work without fear for their freedom or personal safety. The authorities must immediately end reprisals against rights defenders, including detention orders, travel bans, asset freezes, the filing of false and malicious charges, unfair trials, and other violations.